Six weeks ago, my eighteen year old son, Caleb, got to undertake the opportunity of a lifetime. His seventeen year old girlfriend's father works for Mercedes, and had been sent to Germany for a year and a half. The entire family was moving over there for a full year; to soften the blow, they offered to use their sky miles to allow Caleb to purchase a ticket at a ridiculously discounted rate, and also offered to allow him to stay with them for most of the summer. While he was understandably upset at his girlfriend being gone for a year, the trip was an offer he couldn't refuse. Luckily, Caleb had taken four years of German in an International Baccalaureate high school program, so it didn't him too long to be able to converse pretty comfortably with the locals. The seven hour time difference meant that we didn't get to talk to him much, but the magic of Facebook messaging allowed us to stay in touch pretty well. He got to really experience the culture, and spent time not only in Germany, but in Austria, Belgium, and France. Of course, being eighteen meant that one slice of culture that he got to experience was the legal use of alcohol. Now, he has tasted pretty much every beer that I've brewed, plus a nice selection of commercial beers - but it's always just been a taste. There was apparently an Irish pub that the family visited on a regular basis, where he became a big fan of Murphy's Red and good old Guinness. He tried a radler due to his girlfriend's influence (his verdict: it was fine, but wasn't "real" beer), he tried several hefeweisens, and of course, had multiple German lagers. The highlight for him (and a major cause of jealousy for me) was his trip to Hofbrauhaus in Munich. Sadly, the Oktoberfest wasn't yet in season, but fresh Hofbrau Original proved to be quite memorable for him. Being a good son and a good brother, he brought home multiple souvenirs for his family: Kinder eggs for the younger siblings, Milka chocolate and a German Lego book for his brothers, a set of handcrafted nesting dolls and a beautiful, naked wooden fairy for his mother. But dear old Dad got the best of it (at least in my opinion). 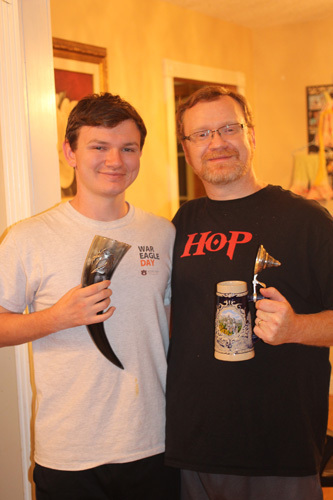 First off, he brought me an absolutely killer drinking horn that he purchased at a medieval festival. It is, of course, smoothly finished, and holds a full pint of beer. However, it also features a pewter dragon near the mouth of the horn - that clinched it for him, and what with me being such a fantasy nerd, it was a perfect gift. Tell me that this isn't cool. Had that been my only gift, I would have been extremely happy. 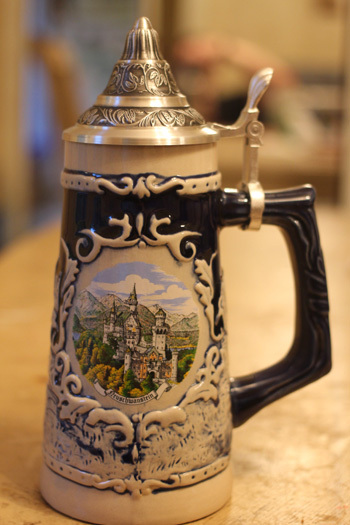 But he went above and beyond, also bringing me a gorgeous stein. The pewter lid is intricately detailed, the colors are beautiful, and it features Neuschwanstein Castle on the front - which he knew would hold extra significance to me, as Walt Disney drew a great deal of his inspiration from this very castle when he created Cinderella Castle at Walt Disney World. What can I say... the kid knows me really well. Check out the beautiful detail. I happened to have one bottle of Hofbrau Oktoberfest left in my fridge, so I felt that it was totally fitting that I christen the stein with it tonight. While the opaque nature of the stein does prevent one from enjoying the clarity of the beer, I can definitely appreciate the advantage that the handle and the thicker material give - namely, the beer seems to stay colder for a much longer time. 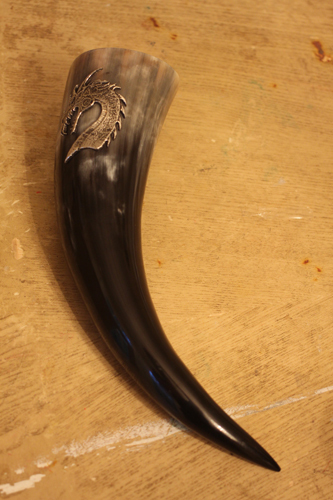 While I haven't used the horn for drinking yet, I will remedy that tomorrow night. Both gifts are very attractive, but they are also meant to be functional; he seemed to get a kick out of knowing that I fully planned to empoly them for their intended use. In just a few weeks, I'll load Caleb up and send him to Auburn University, where he will start the next phase of his life. I've really missed him this past month and a half, and I know that it's going to be much worse when he leaves for college. But I'm confident that he will do well, and I'm pleased to have had a hand in raising such a thoughtful, excellent young man... and I'm so pleased for him that he got to live such an amazing experience. Also, I'm looking forward to sharing beers with this fellow for many years to come. Don't forget that the 2016 BrewUnited Challenge is filling up quickly. As of this post, we have nearly $7100 worth of prizes to give away, but spots are literally filling up about twice as fast as they did in 2015. Right now, only about thirty-five percent of the spots are still available - and the SMaSH category is down to about five slots left! The beer doesn't have to be in our judges' hands until October, so you have plenty of time to brew... but if you want to enter, you need to do so soon!